San Francisco: When you drive a different car each week, people often ask you which is your favorite. I've always had the same answer: the Honda S2000. This little two-seat roadster, at $34,000, is far from the most expensive car I've driven. It's not the fastest either, and certainly not the most comfortable. But after driving one a few years ago - with an engine that revved to 9,000 RPM and a rock-hard suspension designed more for the racetrack than public roads - I absolutely fell in love with it. It was like Honda had designed a car exactly to my specifications and said, "Forget about the rest of the world. Let's build a car just to make Mr. Price happy." RPM before you let the clutch out, making you look like a teenage idiot who just got finished watching "The Fast and the Furious." What's more, the suspension seemed like it was made of concrete, so the car stayed perfectly flat in corners, but your spine felt like it had been run through a Cuisinart blender. The engine was so loud my wife refused to ride in it. Oh, how I loved that car. But Honda couldn't keep good enough alone. Today's S2000 is still an incredible machine - and remains atop the list of my favorite cars - despite Honda taking the edge off and creating a kinder, gentler roadster. The biggest change is a new four-cylinder engine that's 10 percent bigger, now at 2.2 liters. It makes 237 horsepower - the same as the smaller engine it replaced in 2005 - but it's far easier to drive than the old model thanks to its torquier power band. It doesn't stall nearly as easily, so you don't have to leave red lights like those kids in souped-up Civics with rear wings from the Defense Department and exhaust tips from Maxwell House. Still, I prefer the old S2000 engine. When the old one revved all the way to 9,000 it sounded like a dentist's drill from hell, with an anti-social, high-pitched shriek that would scare little kids and make their moms scowl at you. The new one is limited to 8,200 RPM, which is far higher than most street-legal cars but anticlimactic compared with the old, scary one. The rear suspension is softer, too. I'm OK with this change because it seems to have improved the handling, which used to be skittish over bumpy roads. It seems more stable as a result and doesn't sacrifice the car's impeccable, precise handling. Honda added an electronic nanny for 2006 called Vehicle Stability Assist. I usually hate stability systems on performance cars because they cut off the power as soon as a wheel slips, taking away all the fun. Honda's system is tuned perfectly on this car though, as it measures the throttle and steering wheel positions to determine whether you actually want a wheel to skid. It doesn't step in and save you until you've made an incredibly stupid move. Another change for this year is the addition of electronic drive-by-wire throttle control. Honda says it improves engine response compared with an old-style mechanical linkage, but I honestly can't tell the difference. The older throttle felt perfectly responsive to me. It's probably one of those improvements designed more for the racetrack than for the street. Other changes for 2006 are minor, including standard headrest speakers and a revised seat and console design that improves cargo space from microscopic to tiny. The cabin has the same brilliant basic layout, where every important control is within reach of your fingertips without having to take your hand off the steering wheel. This car is so focused on the thrill of driving that it doesn't even have a glove box. It's just a pure, simple, get-me-where-I-want-to-go-FAST sports car. $10,000 to $15,000 less than the $34,000 price of a Honda S2000. Both those cars are about the same fun as the Honda, despite their comparative lack of speed. Then again, if you compare it to the exotic sports cars that it can compete with on the racetrack - say, a Porsche Boxster - the S2000 is a downright steal. It's faster than the Boxster for $11,000 less. A front end that looks like a snake's head hints at how viciously aggressive the Honda S2000 is. It's designed to put the driving experience first and everything else second, making it one of the most thrilling cars on the road. One of the drawbacks of a pure sports car is an uncomfortable cabin. While the driver-oriented layout is fantastic, the racing-style seats, bumpy ride, noisy engine and lack of storage space make it impractical for daily driving. It's an impressive piece of high-performance equipment, but it's not something you'd want to commute in. Still, I'd take a used, hard-to-drive, 9,000-RPM S2000 over the new, sanitized one. What was tested? 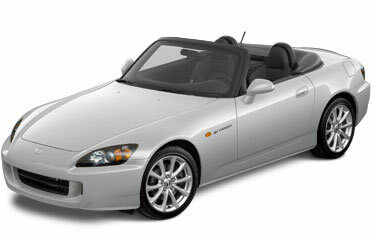 The 2006 Honda S2000 with a base MSRP price of $34,050. Options: None. Price as tested including a $550 destination charge: $34,600. Why buy it? It's faster than a Porsche Boxster for $11,000 less. It's a purist's sports car that is designed entirely around the needs of the driver, with a super-responsive suspension, solid chassis, amazing engine and snick-snick transmission.